Hawaii has it’s pineapples, but for size, color, texture, and taste, the king of the fruits here on the mainland has got to be the watermelon. 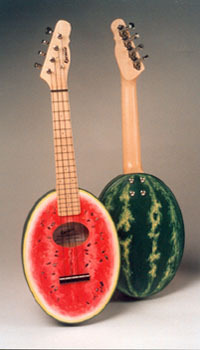 An icon of folk art, plantation lore, and kitchen décor, the watermelon makes a perfect fit with another symbol of camp and kitsch, the ukulele. The Ipulele (Ipu means melon in Hawaiian) is hand painted with uncanny realism by NY artist and uke enthusiast, Kim Do. A concert size uke with a bolt-on maple neck and ash body, the Ipulele is a delicious feast for the eyes and the ears…too bad you can’t eat it!